Prison ministry is important because it meets some people at their greatest time of need with the message of forgiveness while offering the necessary components for change. Prison ministry also helps to reduce the number of re-offenders. But Francis Chan believes that even more fruit is produced from prison ministry in developing more pastors and Christian leaders. In this article we see why Francis thinks as he does. 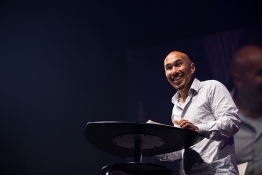 Author and preacher Francis Chan, who recently encouraged hundreds of men inside the walls of Valley State Prison in California with a message of God’s transformative power, shares in a new video why he loves and encourages others to participate in prison ministry. “My interest in prison ministry started, I think, when I started to study the Word a little bit more deeply, and understood the types of people God typically chooses,” says Chan, the former teaching pastor of Cornerstone Community Church in Simi Valley, Calif., in a video posted on the website of the Prison Fellowship. “They are not the people the world would typically choose to do great things,” adds Chan, the founder and Chancellor of Eternity Bible College and author of the best-selling book, Crazy Love: Overwhelmed by a Relentless God. Prison ministry is extremely important and Francis Chan makes some good points. If you are near a prison and this type of ministry interests you, find out more about it and how you can get involved. Find God’s people wherever they are and help them by giving them a step up.